I’m Joining Nicola over on simply homemade blog today in taking a look at the songs that have made the season so memorable for me. There’s something special about the senses before we learn how to speak isn’t there? a smell, a colour, a sound, can transport you over time like nothing else can, either in a good or bad way. Of course with this I’ll only look at the good. My parents loved this song. 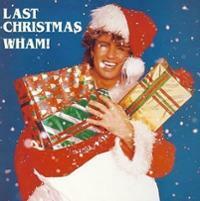 It was played every Christmas in our house for as far back as I can remember. I think it was also played a lot on the radio at the time? I can’t really be sure but all I am sure about is that we were immersed in it by our parents. It takes me back to rainy December days and sitting around watching Police Academy and eating roasted groundnuts. I also have a very vague memory of driving home with my dad in his little red mini cooper in the pouring rain with the song playing in the background. It feels strange singing it now I don’t really believe in it any more, but it still makes me think of Christmas. This is the song that made me realise I wasn’t in Zambia anymore. I first heard it Christmas 2001 on VH 1 classic hits, on the countdown of best Christmas songs. up to then I associated Christmas with religious songs, santa claus related songs, the classic rat pack Christmas anthems and R ‘n B musicians’ Christmas albums. Never had I heard such a different sound. And it was my first Christmas away from home, living with strangers in a faraway place, things were unraveling fast between my then boyfriend and I and I felt so lonely. A friend invited me to spend the holidays with him and his family and the song just tied the whole season up for me. Not that I gave my heart away. If anything, it made me resolve that I would not be so foolish with it in the future. You might say Mariah Carey’s Christmas hits are equally upbeat and uplifting but there’s just something about this song…the season is now not complete till I hear it. Roz groans each time I play it, but she loves it and can sing along to most of the words at this stage. Poor child. I love this version of the song especially because of the animation. I was living in England at the time, with YouTube, Facebook et al still in their infancy, you know, back in the day when people sent you stuff by email. A woman in the office sent this video to all of us in the finance department to brighten up our day and I fell in love with it immediately. It was again a season of firsts. Another relationship close to ending, in a country without any family (my sister was in Ireland) cold foggy weather and the prospect of Christmas on my own. But I got to fly to Zambia that year and spend it with my family, the first and only time I’ve gone in December in fourteen years. This song reminds me of that time. And last but certainly not least, this is the ultimate seasonal song for me. The season began when this song was played on the radio and to this day there’s something incomplete until I hear it. Apparently it’s been played every christmas since the song was released. When I listen to it I can feel the sun penetrating to my bones, taste mangoes on my tongue and the mandatory Tarino that was bought on Christmas day. It brings back another time when my dad, mum, my two sisters and I went visiting at Christmas one year and it rained so hard we were driving slowly, the streets empty of people, all the way home. If you only listen to one song off my list, let it be this one. I love Christmas in Zambia. I miss Christmas in Zambia, so so much. You can read more music and christmas blogs over on Simply Home Made blog by following the link here. Thank you so much for linking up Muuka 🙂 What a lovely selection of songs and wonderful memories. Mabel Mafuya’s song is so joyous, thank you for introducing me to it. I really enjoyed your post Nicola, and had to join.